With a dead battery, you're not going anywhere! Here's how to replace your Porsche's battery. A well-worn or otherwise malfunctioning car battery is a dangerous thing to have in your Porsche 928. It’s also something you shouldn’t ignore, as the battery is the single most important component in the vehicle’s electrical system, and neglecting it can put you in a situation where there’s a risk for a fire. Your Porsche could also die while you’re out, leaving you stranded without a ride home. 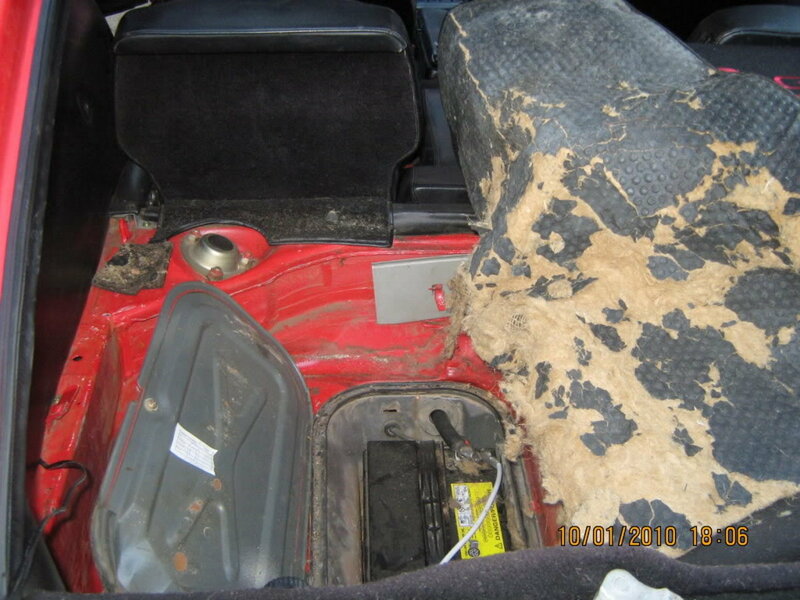 The good news is that replacing the battery in your Porsche 928 is a relatively easy process. You can get a replacement at your local auto parts store for about $100 and complete the replacement in roughly 15 to 20 minutes. While this is a how-to article, one thing to note is if and when you are performing the replacement, you notice damage to the battery compartment area, frayed wires near or otherwise leading to the battery itself, or any other sort of circumstance that looks a bit suspect, you’d be best served to contact an auto body shop to have them complete the process. It's also worth noting that a lot of auto parts stores will replace the battery for free so long as you purchase it at their store. The reason why you want professional help in this instance is because you are dealing with a significant source of power, and any damage to the battery’s housing unit or immediate electrical system could either hurt you during the replacement process, or lead to trouble further down the road. 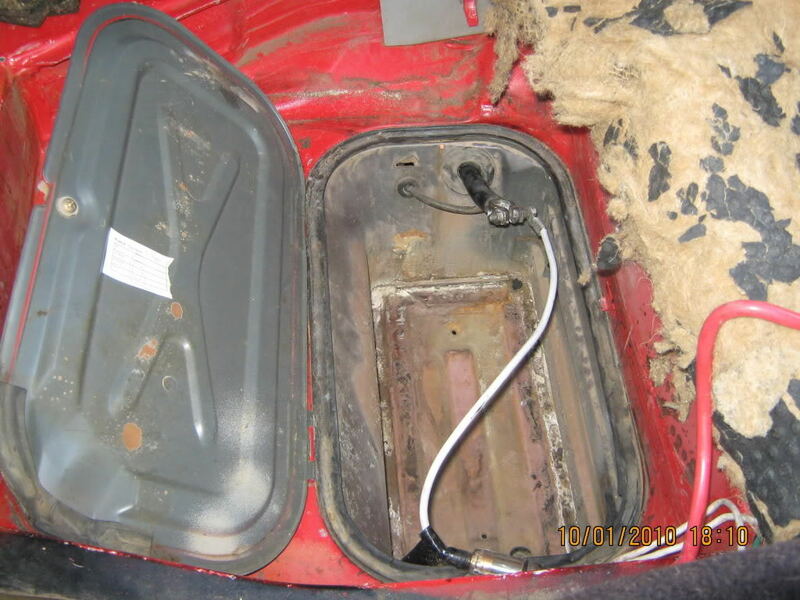 If all looks good, then read further to learn how to replace the battery in your Porsche 928. Porsche’s are, by and large, fantastically-designed vehicles. As such, they hide their parts and components really well, leaving the eye to focus on the car’s body and features. Unfortunately, for the novice owner, this can be a bit frustrating when performing routine tasks like replacing the car’s battery. To find the battery, go to the rear of the car and locate the spare tire. Remove the tire and lift up the carpet underneath. Here you’ll find, more or less, a trapdoor that leads to the battery’s housing unit. Lift the cover, and therein lies the battery. Figure 1. Location of battery. As mentioned earlier, this is a significant source of power you’re dealing with, so safety is an absolute must. The first thing you’ll want to do is disconnect the NEGATIVE battery cable using a wrench. Make sure not to place any metal across the battery posts, as this can cause an explosion (translation: don’t lay your wrench on the battery). Next, disconnect the POSITIVE cable and lay it away from the negative cable to make sure the two don’t cross. Figure 2. Positive terminal (red) and negative terminal (being pointed to). Next, remove your Porsche 928’s battery retaining system; place all parts and fasteners aside in a spot where they won’t get misplaced. Finally, it’s time to remove the battery. When doing so, take caution to avoid knocking it around too much. Now install your new battery in the housing unit. Before you remove the battery post safety caps, check to make sure the connectors are clean and that the red post is in the right spot for the positive battery connector (you don’t want to strain the cable). Wipe down the new battery and double check terminals to ensure they’re clean. Apply a thin layer of dielectric grease and anti-corrosion washers to both posts and connectors (to ensure a long life). Connect the POSITIVE cable first and tighten the connector until snug. Connect the NEGATIVE cable second and tighten the connector until snug. 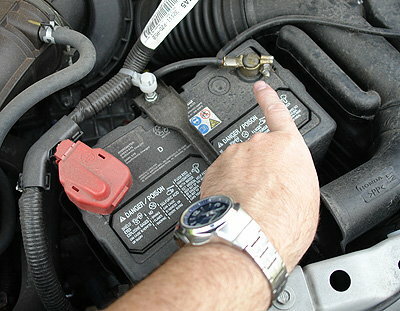 Secure the battery with the car’s retainer system and check to make sure it doesn’t move at all. If everything’s connected and the battery’s not moving, go ahead and turn your car on to ensure the battery works.